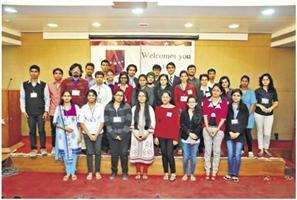 GLS (M.R.Parikh) Institute of Commerce, represented by Anjali Mirchandani, a student of T.Y. B.Com, stood second for overall performance at Intellectus 2014, a national level event which invites participation from undergraduate students across university. Prominent universities such as Gujarat University, Nirma University, Ganpat University and PDPU were among some of the many participants. This year students from a total of 51 colleges and 19 different universities participated in this 2 day long event on 10th and 11th January 2014. GLSIC, under the mentorship of Prof Tushar Raval, has been leaving its imprints at this mega event. 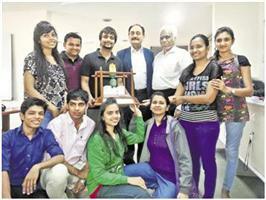 In fact, we were the first to lift the Intellectus 2014 rotating trophy. It is indeed a matter of pride and prestige for GLS(Smt.M.R.Parikh) Institute of Commerce to announce that along with an excellent academic persuasion we made an applauding achievements in almost all the para academic fields. Our college stood First among the eighteen colleges in the Super Event Managers of the year held by National Institute of Event Management (NIEM). Our Students Kunal Gurjar and Kajal Vachheta got a cash prize of Rs. 3000/- and certificates respectively for event management. Also our eight students bagged the 2nd runners up position in “Umang” held by National Institute of Event Management and got a cash prize of Rs.5000/-.The professors incharge for the winning performance are Prof Avni Shah and Prof Mala Dani. GLS(Smt.M.R.Parikh) Institute of Commerce feels glad to add some more feathers to its glory crown. The glistening achievements in the short course of the current year are achieved at an unprecedented level. The college has achieved remarkable awards in different fields. Congratulations to the students…. • Harshal M Gilder won third prize at district level for “Quickie” Ad. Film competition in Young Voters Festival- 2013 organised by Election Commission of India. • Anam Shah won the 2nd prize for Collage Competition and Darshan Nagar won the prize for Poetry Recitation Competition organized by GLS Voice. • Arpita Jaichandani student of T.Y. B.Com and Hardik Prajapati student of S.Y. 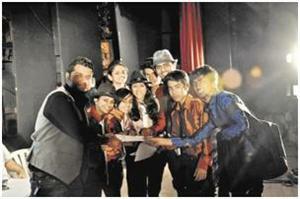 B.Com won the Third Prize in “Kaleidoscope” Duet Singing Competition organized by J.G.College of Commerce. This year has been a rewarding one to GLS(Smt.M.R.Parikh) Institute of Commerce in the field theatrical activity. We take immense pride in announcing that the our drama team of 25 students has given amazing performance in INT Drama Competition organized by Gujarat Samachar. We presented One act Play “Dhrunad Kamle Aapghat Kare Che” stood at First Position in INT Drama Competition and won the 10,000/- cash prize with rotating trophy. Our student Sarjan Trivedigot second prize for Best Actor and won 2000/- cash prize. Director Chirag Modi and Dhrunad Kamle also won First Prize for Best Direction. The student team of GLS (Smt.M.R.Parikh ) Institute of commerce and incharge faculty Prof. Ankit Bhojak deserve an applause. Hastimal G. Sagara, Assistant Professor, GLS (Smt. M. R. Parikh) Institute of Commerce delivered a keynote address on ‘Research in Social Sciences’ in the 13th State Level Annual Conference on ‘Research Methods and Methodology’ jointly organized by Kadi Sarva Vishwavidyalaya, Gandhinagar and Gujarat University Economics Teachers’ Association, Ahmedabad on 18th January, 2014. He has been awarded with ‘Travel Grant’ by the Ministry of HRD, Government of India to visit 3 universities, namely, JNU New Delhi, IIIT Bangaluru and CDS Trivandrum, for academic purpose for 2013-14. Rushikesh Vinodbhai Patel, F.Y.B.Com student of GLS(Smt. M.R.Parikh) Institute of Commerce won the Bronze Medal in the 12th Hongkong International Wushu Championship. The Competition was held at Hongkong between 17th to 22nd March 2014.He also won the silver medal in the same competition last year. We congratulate him for his great achievement. 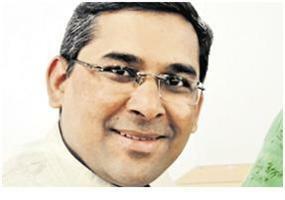 Prof. Tushar Raval, Dept. of English, presented a research paper on ‘Professional Development And Self-reflection As Part Of Education And Training: A Holistic View’ on 1st March, 2014, in the International Conference jointly organized by GLS (Smt. L & C Mehta) Arts College, Dept. of Psychology and Indian Academy of Applied Psychology. Around 800 delegates across the world took part in this International Conference. Prof. Tushar Raval jointly presented a research paper with Prof. Mayur Agravat which was examined by Dr. Kamlesh Singh, IIT Delhi, & others. His research paper was selected as the ‘Best Paper in Scientific Session’.